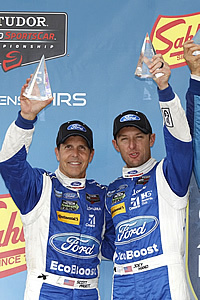 WATKINS GLEN, NY (June 29, 2015) – Chip Ganassi Racing with Felix Sabates (CGRFS) with drivers Scott Pruett and Joey Hand finished second in the Prototype class in the Sahlen’s Six Hours of The Glen at Watkins Glen International. The starting lineup up for the iconic six-hour race was determined by driver championship points after inclement weather conditions forced the cancellation of qualifying. Hand started the No. 01 Ford EcoBoost Riley in the fifth position as rain began to fall steadily on the 3.4-mile road course. The first full-course caution came out shortly after the race started. Hand took advantage of the caution to pit for fuel. The No. 01 made its way into the third position before Pruett took over the wheel. After cycling through pit stops, Pruett gained the lead as he opened his first and only stint of the race. The No. 01 continued to lead until pitting during the fourth full-course caution where Pruett restarted in the third position just before the halfway mark. The team continued to run slick tires until Hand took over the wheel for his second and final stint. Hand restarted in the second position, but red flag conditions took over as the rain began to pick up. The race resumed with just over an hour remaining; however, a slick track caused the No. 10 to spin from the lead and make contact with the No. 01. Hand continued to run despite the contact and took over the lead. A late-race pit stop resulted in misfortune as the last full-course caution for multiple cars stopped on track came out with the No. 01 on pit road and six minutes on the clock. Officials determined the track would not be clear before the allotted time ran out resulting in a second-place overall finish. The next TUDOR United SportsCar Championship race will be the Mobil 1 SportsCar Grand Prix presented by Hawk Performance in Bowmanville, ON at Canadian Tire Motorsport on July 12.  Qualifying for the Sahlen’s Six Hours of The Glen was cancelled due to inclement weather conditions and starting positions were based on driver championship points.  It was a tire strategy race as team’s battled between rain or slick tires due to the on and off rain conditions.  The finish marked the No. 01’s second podium finish of the year.